DEATH PENALTY, the new band formed by ex-CATHEDRAL guitarist Garry "Gaz" Jennings, featuring Belgian female vocalist Michelle Nocon (ex-SERPENTCULT) and guests, has inked a deal with Rise Above Records. 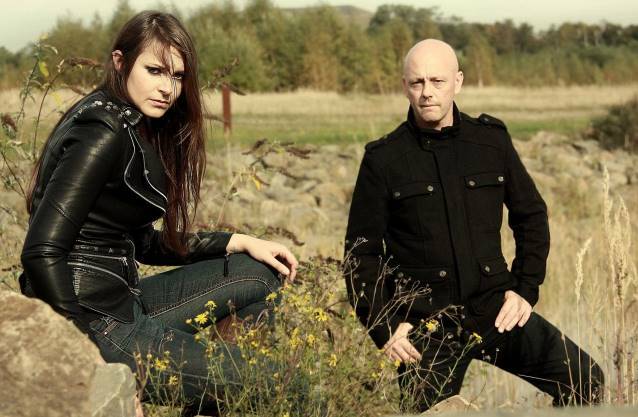 This is Gaz's first serious venture following the mournful demise of the U.K.'s doom metal giants with their final album, "The Last Spire" (via Rise Above), earlier in 20013. He has been working on songs for his new venture for some time and had the idea of a strong female vocalist, which led him to Michelle and the pair have been working together since the summer. Says Jennings on DEATH PENALTY: "DEATH PENALTY is a project I have been working on for over a year and a half. "After the burial of CATHEDRAL I continued to write songs where I have now in excess of 20. "This is a different beast to CATHEDRAL — more heavy metal, but still with elements of my former band. "I had only one vocalist in mind for this project, and luckily, Michelle agreed to do it. Wait 'till you hear what she can do. An incredible voice and a fantastic talent." On signing to Rise Above Records and the appearance at the label's forthcoming 25th-anniversary event, Jennings said: "I am truly honored to sign with Rise Above Records. "Having been in CATHEDRAL from the very beginning and having a friendship that has lasted 25 year, I'm in the right hands. "We hope to record our debut album in March/April 2014. We have 13 songs planned. We will have a limited seven-inch single released before that. "As for the anniversary gig, again looking forward to playing what will be our first-ever show on such a great bill. "At the moment, we are working as a four-piece but hope to add another guitar player in the near future. Besides Michelle and myself, we have Frederik 'Cozy' Cosemans on drums and Raf Meukens on bass. "My dream of having a Belgian metal band has finally been realized! "And where do you think I got the band name from..?" The bill for the Rise Above-anniversary shows is now shaping up to be an all time classic event not to be missed. There will be one more announcement, hopefully confirmed next week, then the label will announce the billing not long after that. The event takes place at The Garage, Highbury & Islington on December 27-28 from 4 p.m.